At Miami's plush Palm Bay Towers condo, residents locked in a long-running feud over costly window repairs were shocked by a city order condemning the building. The city had condemned the building. Water and power would be cut Jan. 3, and the building would be torn down. "I never had such a fright in my life,'' said classical music impresaria Judy Drucker, whose Palm Bay living room holds a Steinway grand concert piano at which stars like Plácido Domingo and Pinchas Zukerman have performed and rehearsed. The building hasn't been shut down, though it took an emergency court order and the unusual intervention of the City Commission to override, temporarily, the actions of its own chief building official, who declared the ultra-posh tower unsafe under a law typically used to condemn blighted properties. But the holiday saga exposed a bitter, years-long feud among Palm Bay's residents over aging windows that threatens the building's future, a feud that has seen some of the city's leading lights trading cold shoulders and worse -- lawsuits, accusations of lying, even allegations of undue influence. 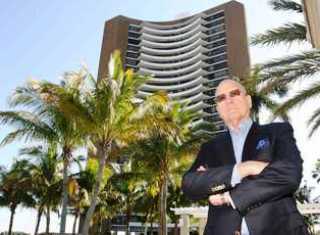 Palm Bay Towers, a condo project that has been home to many rich and famous Miamians,has been hit with a demolition order from the city of Miami. It failed to comply with an order to replace the windows and now only a court order has stopped a Jan. 3 demolition date. Bob Flanders has been battling with the condo association to try to get the association to fix the windows for years. Though few believe the city will demolish the building -- for one thing, it could cost millions of dollars and excise a valuable property from the tax rolls -- the order remains in force, and at least some residents believe the threat of a shutdown is real. Under the emergency court order, the building has 45 days, until mid-February, to end the squabbling and convince the city that it's serious about assessing and fixing long-unresolved problems with its windows. The feud -- and Miami building official Mariano Fernandez's condemnation order -- centers on the 26-story tower's nine-foot-tall windows, at least some of which are badly deteriorated and unsafe in a hurricane. Because this is no ordinary building, these are not just any windows -- but 1,875 floor-to-ceiling sliding doors and glass panels that constitute the exterior walls of the three-cornered tower, which rises dramatically on massive pylons sunk into Biscayne Bay at Northeast 69th Street. The aluminum-frame windows, installed when the building was constructed in 1972, have been pummeled by hurricanes and corroded by salt air to the point where, some owners complain, they have been forced to resort to duct tape or caulking to keep wind and rainwater out. Depending on whom you ask, and how you interpret engineering studies commissioned by dueling resident factions, the windows have been in need of repair or replacement since 1992, when Hurricane Andrew blew out several panels, or since 2006, when the one-two punch of hurricanes Katrina and Wilma did further damage. Though the building staff subsequently installed full-metal shutters, it's under standing orders to evacuate in a hurricane warning. For several years, one Palm Bay faction, led by Upper East Side activist Robert Flanders, who has served on several city boards, has been pushing to have all windows replaced. For just as long, Flanders and his supporters have been stymied by an equally determined faction that remains unconvinced of the need for full window replacement -- a job that, by some estimates, would cost around $5 million. And there's the rub. Because the building has just 72 units, most as big as a house, that works out to special assessments ranging from $60,000 to $100,000 for each owner -- and even more for some residents, like banker and philanthropist Jay Kislak, who own more than one unit. In spite of the building's hoity status and history -- it was constructed as a private club for a select slice of the city's social elite -- some longtime residents are now elderly or ill, no longer wealthy, and say they would be forced out of their homes or into foreclosure because they cannot afford the assessment. After Wilma, the condo board approved a plan to replace the windows. And all hell broke loose. Led by 84-year-old Bacardi heir and longtime board member Jorge Bosch, dissenters got a majority of unit owners to recall the board and nixed the replacement plan. The reconstituted board commissioned an engineering study that suggests many windows, perhaps a majority, may not need replacement. Flanders sued the board to force replacement, saying he did so only because leaky windows were damaging his wood-parquet floors and mildew was sprouting on his cloth-covered doors. The suit is pending. "It's a terrible position to be in, to sue your neighbors,'' Flanders said. But Flanders said residents of a plush building like Palm Bay should be able to afford the cost. "This building was built for rich people. We had to prove we had a minimum net worth of $1 million to move in in 1980,'' Flanders said, referring to a club requirement that has been rescinded. Then someone on Flanders' side called in the city. And the group, bolstered by resident and attorney Jorge Ramos, began pressuring Fernandez to take action. Ramos boasted of a childhood friendship with Fernandez, according to several building residents who say he also told unit owners who could not afford the assessment to move out. Fernandez did not respond to repeated requests for an interview, though he e-mailed a chronology of enforcement actions. Ramos did not return messages left on his home phone and his wife's cellphone last week. Some residents saw sinister motives at work, and said so out loud. According to letters he sent the condo, Fernandez determined that the windows indeed may require total replacement, and he and other building officials issued a succession of deadlines for the building's new board to come up with a plan -- none of which were met. "The association board basically stuck its head in the sand and ignored all the documents,'' Flanders said. Bosch acknowledges as much, blaming the death of the board's engineer and the building's inability, amid the nationwide fiscal crisis, to secure financing. The building got a permit to replace windows on the first three floors but did no work. In May, the Palm Bay association appealed Fernandez's orders to the county's Unsafe Structures Board, a quasi-judicial body empowered to order buildings torn down, but received an ultimatum: Fix the problem, or face eviction and demolition. Bosch and his board again failed to act. In early December, Fernandez issued his eviction and demolition notice, catching many people in the building by surprise. Some believe Flanders' faction got more than they bargained for. "This is a very serious game of brinksmanship,'' said South Beach restaurateur Tim Hogle, a Palm Bay resident uninvolved in the feud who recruited Coral Gables attorney Paul Savage to help negotiate a solution with the building department. "I don't think any reasonable person really believes this building is unsafe. At least one city commissioner faulted Fernandez and his superiors at the building department for failing to notify higher-ups of the impasse. City Commission Chairman Marc Sarnoff, whose district includes Palm Bay, said neither he nor City Manager Pete Hernandez learned of the notice until after it was issued. At Sarnoff's request, the City Commission passed an emergency resolution asking the city to put off action, though commissioners have no legal authority to overturn the building official's determination. Hogle says he has since made "substantial'' progress in convincing Fernandez and other building officials Palm Bay is serious about satisfying their concerns -- though it's still to be determined whether the fix will be full window replacement. A panoply of obstacles remains, he said: First, winning the consensus of both factions, then securing financing. The building's bank has pledged a $1.5 million loan, and some owners may be in a position to front the amount of their assessment, but Hogle warns unpaid assessments could result in building bankruptcy. He has set up a town hall meeting with Sarnoff and building officials at Palm Bay for Jan. 26. In the end, Hogle said, it will be up to building residents to disarm.